Coastal conservation in the Northern Agricultural Region is set to receive a boost after NACC NRM announced the recipients of its latest round of Coastal Community Grants. The latest round of grants include projects deploying drogues equipped with GPS unit to track the wave movement under a variety of winter weather conditions; promoting awareness around coastal saltmarshes; survey of vegetation, fish and terrestrial vertebrate fauna; and new interpretive signage along the Turquoise coast. 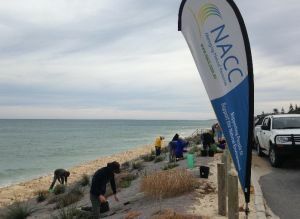 According to NACC’s Biodiversity Program Coordinator Dr Jessica Stingemore, the grants will help enhance the community’s awareness of the vital part our coastal ecosystems play in maintaining a healthy community and economy. The groups who have been funded through the grants are spread along the coast from north of Geraldton to south of Lancelin and showcase some of WA’s most spectacular coastal ecosystems. These grants are supported by NACC NRM.